This is my favorite brownie recipe ever. 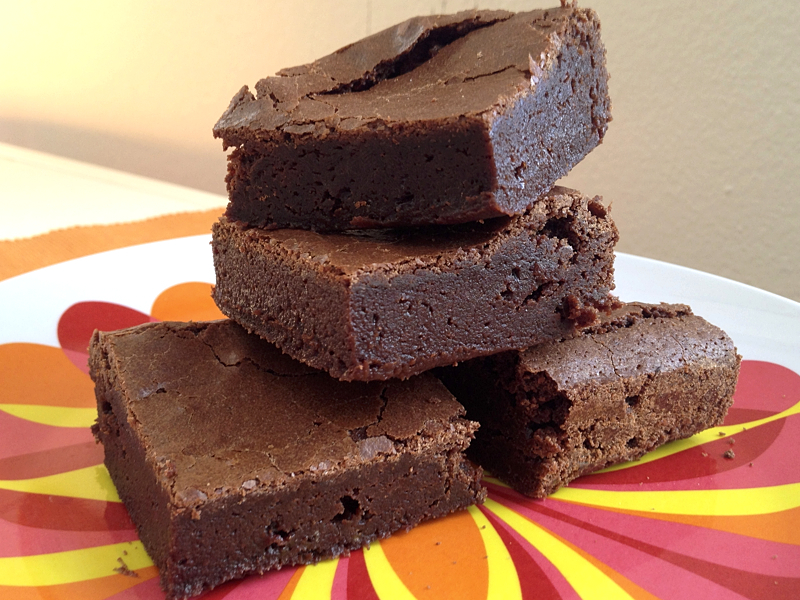 For me, the perfect brownie should be super indulgent. None of that dry cakey-ness that passes for brownies at the super market. The perfect brownie should have an ever so slightly crunchy 'skin' on the exterior that leads way to chewy melt-in-your-mouth chocolate goodness inside. It's ok if there are chocolate chips in there, but the base of the brownie should really be able to stand on its own. Before I became a baker my favorite brownie mix was Ghiardelli's- those brownies embodied what a real brownie should be. 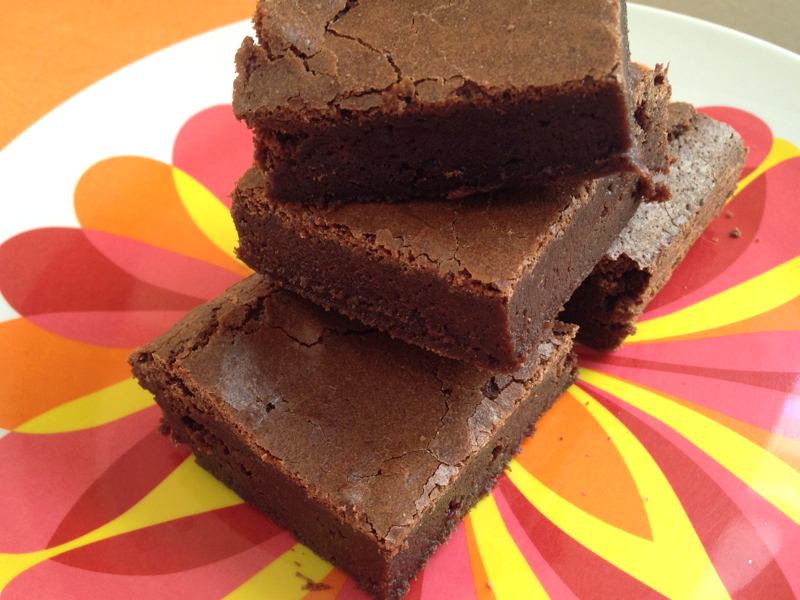 Then I set foot in the kitchen and for years I absolutely loved the brownie recipe in Tartine- the use of chocolate in them instead of cocoa powder made for intensely rich brownies. But then these fell into my lap mouth and it's been a love-affair ever since. The brown butter adds a touch of nuttiness and the espresso just strengthens that chocolate flavor ten-fold. These are everything a brownie should be. The only terrible thing about them is that they fill your home with amazing chocolate aroma and then you have to wait for them to cool down before you can indulge! - Preheat the oven to 350 degrees Fahrenheit. Prepare an 8x8" square pan by lining it with foil. - Melt the butter in a small saucepan; use a wooden spoon or spatula to stir the butter around occasionally. The butter will begin to boil, once this happens keep an eye on it and stir more frequently. The bubbles will get very big and then start to shrink back down and you'll start to see brown specks making their way up to the top. Once the brown specks appear start to scrape the bottom of the pan. When the butter is a light golden brown color, (this shouldn't take more than a minute or two) take the saucepan off the heat. - In a large mixing bowl combine the sugar, cocoa powder, and salt with a whisk. Stir in the browned butter, making sure to scrape all the brown speckled goodness out from the bottom of the pan as well. Stir everything well with your wooden spoon or spatula and add the vanilla extract and espresso (or strong coffee), stirring well to incorporate. Add in the eggs and stir well to combine. Add the flour and stir just until incorporated. - Pour the batter into the prepared pan and smooth the top with a spatula. Bake for 25 minutes, or until the top starts to crack slightly. Let cool completely before cutting. - Enjoy! Brownies will keep for a few days in an airtight container; they'll keep even longer in the refrigerator.